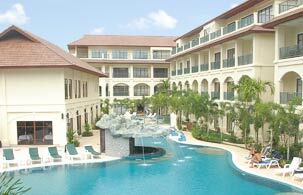 PHUKET VACATION APARTMENTS are two 100sqm 2 bedroom, 2 bathroom apartments within the brand new Club Lersuang Resort. Each apartment sleeps a maximum of 6 people. Replenish yourself in luxury accommodation at affordable prices! 1st Oct. to 14th Dec.
1st Oct. to 30th Nov.
FREE Airport pick-ups and drop offs before 8pm. FREE high speed wireless Internet connections in the apartment. The resort also has an Internet cafe. Brand New! Clean and Pristine! The resort was completed in November 2005. Feel safe and secure knowing you are staying in a building constructed by a British company. High quality fixtures and fittings. Have fun with the kids! No need to torture yourself carrying overloaded suitcases full of kids toys. Children's toys, Lego, pool toys, DVD's and so on provided. Greco cots, high chairs, safety plugs, baby baths, baby monitor, child plates and cutlery and more are available upon request. ALL FREE! Fantastic children's pool! The fully equipped kitchen allows you to cook for your kids if need be. On the doorstep of two of Thailand's most popular beaches, Bang Tao Beach is 200 metres away. Sit in the shade under beach umbrellas sipping on anything from fresh coconut juice to cafe latte. Huge 50 meters long swimming pool! Take in the sites of the tropical gardens surrounding the pool. Children can splash around safely in the children's pool. Isn't it great to have a view! From the main bedroom, living room, dining room and kitchen you have a full view down the length of the 50 meters pool and tropical gardens. Ocean views from the outdoor entertaining area. Relax those tired muscles in the Sauna and Spa! You can truly put your feet up and relax at Phuket Vacation Apartments. Get fit in the gym while you are on vacation! You are seconds away from your own fully equipped gym and fitness center - the best on Phuket! Daily Maid Service. You don't need to do anything! You don't need to do anything! Mrs. Taew takes care of housekeeping. She has experience working with children. Babysitting, cooking and laundry service available on application (not included in rental rate). All linen and pool towels provided. Have fun going on tours! Reception will help. For help with choosing tours or any questions you may have please ask at the reception desk. I found the apartments to be excellent value. They had a very relaxing feeling of convenience and were much more comfortable than a hotel. I will definitely feel comfortable bringing my kids to stay there, moreso than at many hotels on the Island, as the combination of safety and convenience and pricing makes for a very relaxing family setting. They are close enough to the beach and restaurant scene, while still in a quiet and laid back setting that will allow our family to take Phuket at our own pace. Beautiful furnishings, and the health club was superb. We ate at the restaurant several times and really enjoyed it; great value for money and excellent Thai service. Never in my life had I dreamed that some day I would be spending a week in paradise. Now if anyone would like to get away from it all, hang out in a fully-equipped, luxurious two bedroom apartment overlooking both a pool and a bay with daily maid service to boot, let me tell ya, this is the place. Every day seemed to hold new surprises for us such as exquisite and reasonably priced room service meals. That’s right, breakfast served in bed unless we opted for our delightfully sun-drenched veranda. Laundry? No such worry. Feeling a bit sore after that five minute walk back from snorkeling along the bay? No problem. One phone call and the masseur is on her way for the price of a Coney Island hot dog! Need to connect with others back home or just idle away? High speed internet and cable TV are ready and waiting both in the living room or a few feet way in the restaurant. Thanks! Say, is it too late to book the whole month of January next year? When we do return we will definitely be staying at your apartment. To be honest we had a great time spending in Phuket and the apartment was perfect to us. When it comes to repeat the Phuket vacation I will surely contact for possibility to stay in your apartment once more. Looking into your improvements done/ planned I have nothing to add. It surely exceeds our list of remarks if any. The airport and maid service in addition were very convenient as well. Personally I appreciated the internet connection which enables me to keep track on my business. I will come back to you re feedback of your fab place, will def, def come back hopefully soon!!! Would you bee so kind to send my love to your housekeeper Dow (whom we became very close to). I really enjoyed the apartments and so did the children, they were very happy. We'll be back in a few months. We did have a lovely time in your apartment. Everything was very good. We have told all our friends about your lovely apartment. A bit belatedly, I would like to say how much we enjoyed our stay in Phuket Vacation Apartments. We had a wonderful time, the apartment was absolutely perfect, in fact my daughter, who has travelled extensively, says it is the best apartment she has ever stayed in. There is nothing we can add to say things could have been improved, it was perfect. Also Mrs Taew your housekeeper is an absolute gem, always there to look after us and to provide any extra service we may have requested, she was fantastic. Even the pick-up and drop off at the airport were perfectly arranged and the help we received was truly commendable, with all persons involved being helpful, friendly and courteous. So if we visit Phuket again, we will definitely be in touch and we sincerely thank you all for everything. Doreen and Amanda - England.